Author's Note: Sorry for the delay, but I'm having some Internet connectivity problems the last couple of days and it doesn't seem to be an end in sight. Last week was almost a washout as far as watching anime goes, but I finally got to watching a series on Friday and Saturday, so I can talk about that! Soul is on the cutting edge of Kishin killing. 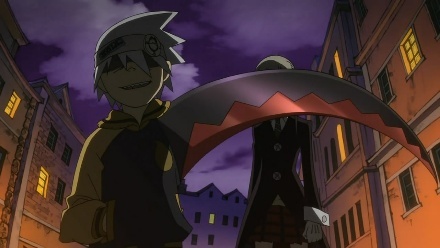 This isn't actually the first time I have watched Soul Eater, but it's not a re-watch either. I started watching the series but stopped a little over half way through and either got distracted or lost interest. The same thing happened twice with Fullmetal Alchemist, so I decided to try it out again and make it through the entire thing. I'm about 3/4 the way through and I just can't seem to get as excited as I was at the beginning of the series. Some series has this lull in the middle where it's either filler or not as exciting as the first or last part. That's not to say I don't like it, but I think cutting about 10 or so episodes of this series would have been a good call. 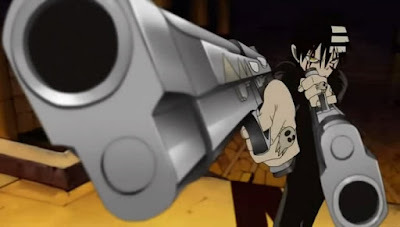 Death the Kid uses the same weapons I favor in Counter-Strike: Source! What I love about Soul Eater is the style. It look like an anime with some Tim Burton influences. The colors and animation are bright and vibrant and it is hard to look away while the show is being played. I'm super surprised there hasn't been a TV deal with this series over here because I think it would kill, no pun intended. So that was my week, what did you see this week? Comment below!